In windows, registry is the heart. Every action or settings are recorded inside registry. In Microsoft windows, Registry are divided into subtrees. 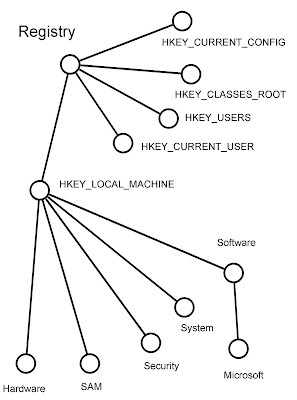 From the root, there are five subtrees (HKEY_LOCAL_MACHINE, HKEY_CURRENT_USER, HKEY_USERS, HKEY_CLASSES_ROOT, and also HKEY_CURRENT_CONFIG). keep all settings for the harware currently installed in the machine. Keeps the DEFAULT profile which describe how windows will behaves when no one is logged on or keeps settings for new created user. Keeps all the file association information and the OLE(object linking and embedding) registration database. Keeps all the hardware configuration at boot-up time.